A Worthing baker delighted with her new home has cooked up her biggest project yet in aid of a local charity – her new-build house in cake form! Libby Pearce and her partner, Nathan Long, are so happy with their three-bedroom Sheringham home at Bovis Homes’ Saxons Plain location in Worthing, that she was inspired to go to work reimaging it as a tasty sweet treat. Libby, from Worthing, has now donated her creation to nearby hospice St Barnabas House, which looks after adults with progressive life-limiting illnesses. Libby, who also bakes cupcakes for new Bovis Homes house owners at Saxons Plain, said: “Handing over the Sheringham cake to St Barnabas House was a bitter-sweet moment as it took me two days to construct and it is the biggest baking project I have ever undertaken. “The cupcakes I supply to Bovis Homes customers on completion of their homes are decorated in the Bovis Homes colours with a logo on top. I will continue to supply these until the development is finished." The proud homeowner likes nothing more than to bake cakes in her home kitchen and has launched her own business, called Libby’s Bespoke Cakes. Libby, previously from Portsmouth, has been a pastry chef for more than eight years and comes from a fine dining, Michelin-star background. She has worked at a local bakery for more than three years and started baking from a very young age. 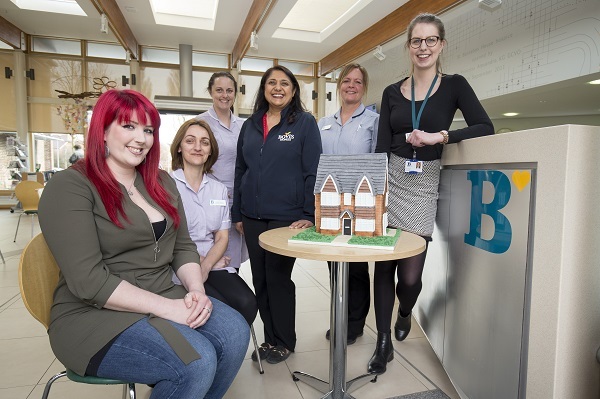 Palvinder Calliste, area sales director for Bovis Homes’ South East region, was on hand to see the cake being presented to the hospice. Jo Bacon, community fundraising officer at St Barnabas House, on Titnore Lane, said the treat had gone down very well with cake lovers. “The Sheringham house cake looked absolutely wonderful and tasted it too – you could see the time, effort and skill that went into it and we’d like to thank Libby for making our week,” she said.